My grandmother is 100% Italian and comes from an Italian speaking family. Needless to say, but we had a lot of pasta and amazing flavorful Italian dishes growing up. Eliminating grains was one of the best things I did for my health, but I totally missed my Italian pasta dishes. But when I discovered the Spirelli, it was a game-changer. 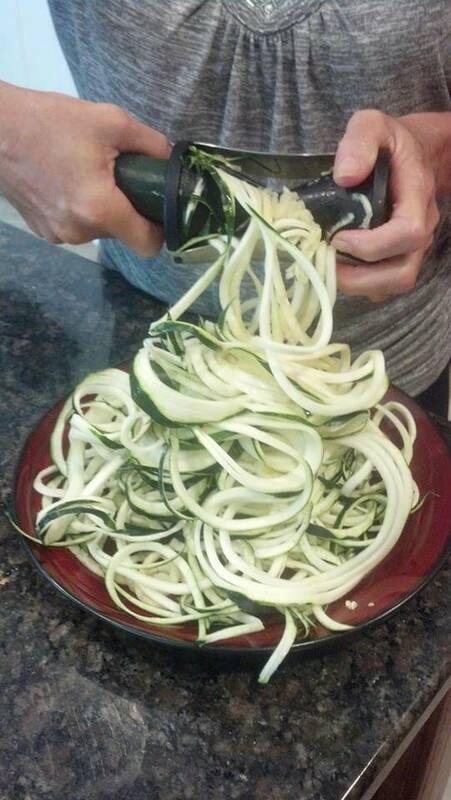 I now make zucchini and squash “spaghetti” dishes a few times a week because they are quick, inexpensive, extremely nutritious, and best of all, they taste like the Italian dishes I grew up eating and loving. I also love baking a spaghetti squash and using the flesh for my spaghetti, too. These Italian meatballs hit our kitchen table at least once a week. I usually make a big batch of meatballs ahead of time, freeze them, and then pop a few out whenever I need a quick meal. 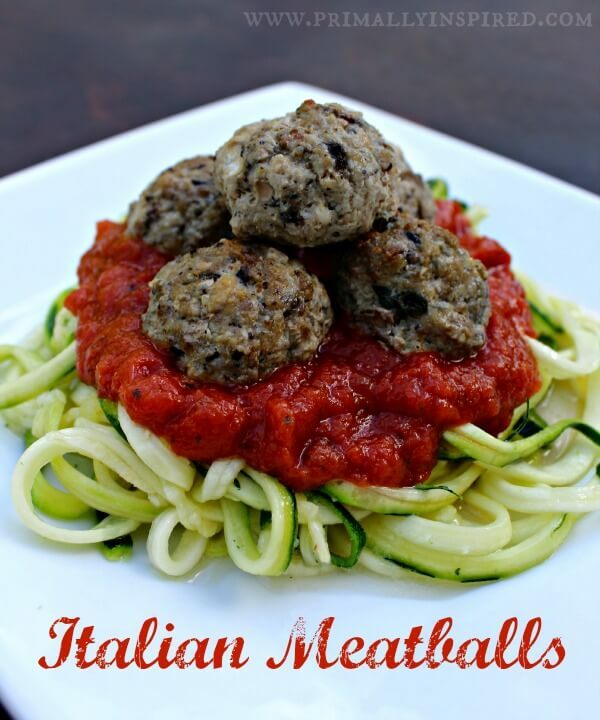 I love serving these meatballs with my homemade garden pasta sauce recipe, but on nights I’m in a big hurry and just need to throw something together, I use a store bought organic pasta sauce. 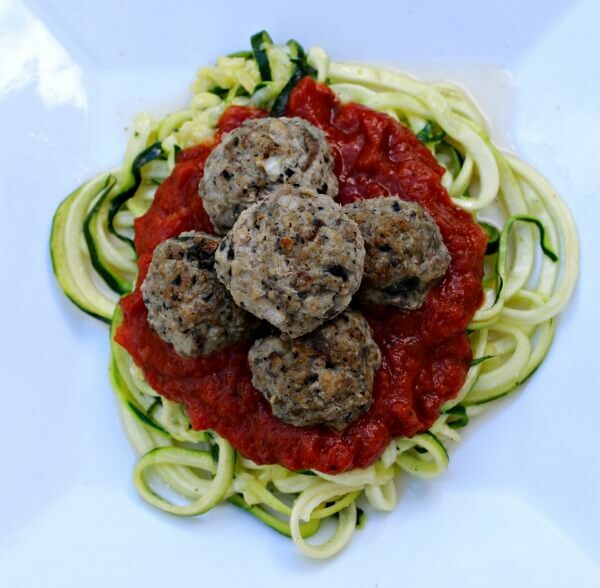 The key to a totally moist and super delicious meatball without using grains or eggs is VEGGIES! So load these babies up with whatever veggies you like. If you have kids, this is an awesome way to sneak veggies into the meal. Just be sure to chop them up extra fine and they’ll never even know they are in there. And don’t forget to check out my Paleo Chicken Alfredo if you are an Italian food lover like me. It’s one of my very favorite dinner recipes! Mix all ingredients together in a large bowl until well mixed. Shape into desired size meatballs. Bake on a rimmed baking sheet for 25 minutes or until thoroughly cooked. 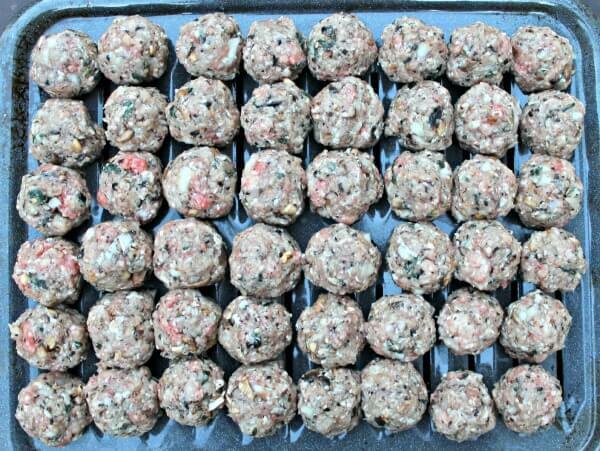 If freezing: place meatballs on a single layer on a baking sheet. Freeze for 1 hour or until hardened (this prevents them from sticking together). After they are completely frozen, place them in a freezer safe container. This allows you to get as many as you need out of the freezer without them all sticking together! 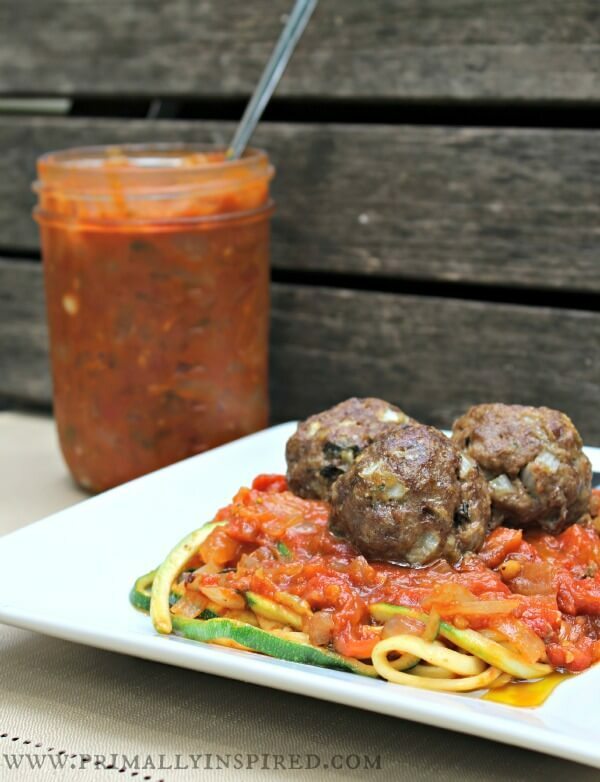 Serve with homemade pasta sauce or an organic store bought version like THIS one. Serve with lightly sauteed zucchini or squash noodles or with a baked spaghetti squash. Are you an Italian food lover like me? 🙂 What’s your favorite Italian inspired dish? Swoon!!! These look so amazing, I don’t think I would be able to stop! Looks yummy! What temp do you bake these at? Could I substitute dry basil and oregano? If so, how much of each? Yes for sure! Usually you want 1/3 less of the dry version than the fresh. So for this it’d be 2 teaspoons of each. I just came across this recipe and haven’t had a chance to try them yet… but do you have to have to include the pork? Or would just the ground beef be ok? Just the ground beef will be great, too! Thanks for the recipe. Loved it! Oh my, DELICIOUS!!! Used all grass-fed beef instead of pork. So yummy! Thank you! Hi! 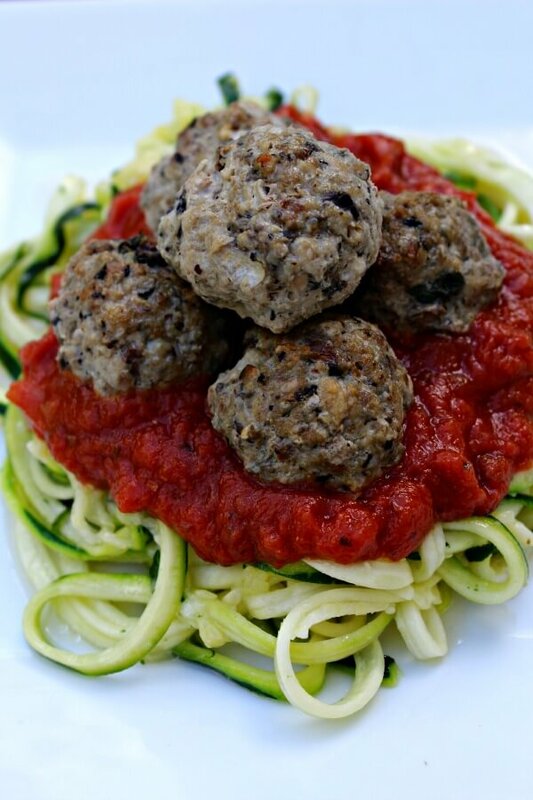 These are on my meal plan for this week and I’m already salivating! I wanted to let you know since you mentioned to leave off the cheese for whole30 that the organic tomato sauce is also not whole30 compliant because it has added sugar, even if it is organic! Homemade sauce it is!!!!! Can’t wait!!! Yummmmmm!!!!!!! Hope you love these, Elizabeth!! Nothing beats homemade tomato sauce!